With so many groomed, lighted trails, a dedicated Nordic ski association and a big wild backcountry to explore, there&apos;s a trail for skiers of all ages and abilities. Anchorage has hundreds of miles of trails, and none of them hibernate. Runners, bikers and skaters take advantage of multi-use trails in the summer months, but winter brings another breed of outdoor enthusiasts, cross-country skiers, out to play. 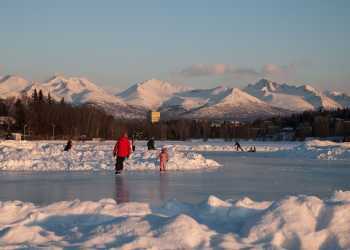 Kincaid Park is the crown jewel of cross-country skiing in Anchorage. With 60 kilometers of trails winding through 1,400 acres of parks, it&apos;s no surprise Kincaid regularly host national cross country events and community cross-country races. The park also boasts a biathlon range for skier taking aim at the Olympic sport. Beginners will find plenty of flat trails winding through the city, and many access points from parks along the way. The Tony Knowles Coastal trail runs 11 miles, connecting Kincaid Park to downtown Anchorage. Chester Creek Trail runs east from Westchester Lagoon to the Russian Jack Park – another prime ski spot – and beyond. For a real Alaska experience and some serious cardio, break new track in the backcountry. Powerline Pass if a prime spot for backcountry skiing. Girdwood, Alaska may be best known for Alpine skiing, but Nordic enthusiasts won&apos;t feel left out either. The Moose Meadow is a popular route, and a new loop trail cleared in 2011 stretches 5 kilometers through the woods near Alyeska Resort. The Tour of Anchorage is part of the longest running series of community ski races in North America. Winding through the city with 50, 40 and 25 kilometer routes, it&apos;s one of the best ways to explore the trails system with the locals. The Ski 4 Kids puts pint-sized skiers on the trails at Kincaid. Ski races, an obstacle course, and a biathlon event that pairs skiing and slingshots keeps it fun for kids up to age 14. The Alaska Ski for Women is by far the most colorful and most fun race on the calendar. In this annual event held every year on Super Bowl Sunday, participants don elaborate, colorful costumes for the race, making it an amazing spectator event as well. Ski for Women has a twofold mission: encourage women of all ages and abilities to take part in an organized Nordic skiing event and raise money to support local non-profit organizations that provide safe harbor and support services for women and children affected by domestic abuse. For one of the best ski experiences of the year, make tracks to the Alaska Railroad depot. Each year, the wildly popular ski train departs for a one-day ski adventure in Southcentral Alaska. The ride is half the fun, the rail cars for Polka, boom boxes, families and a quiet car for silent reflection on the winter landscape. The Nordic Skiing Association of Anchorage, Inc. offers the Nordic ski enthusiast abroad range of information about skiing in Anchorage. Members receive a subscription to Alaska Nordic Skier and a chance to support and encourage Nordic skiing around Alaska. Funds received are used for the grooming and maintenance of more than 130 kilometers of ski trails. NSAA also sells a trail map that includes Kincaid, Bicentennial, Mahaffey, Russian Jack and Bartlett parks.